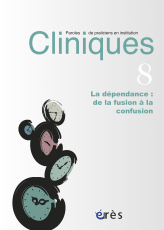 Cliniques publishes twice a year scientific and theoretical / clinical articles (quantative or qualitative studies, case studies, review articles, ongoing researches) and holds its specificity in its editorial line which is centered upon psychological care exclusively within care institutions. The two annual issues explore a same theme but treat it differently in order to offer the readers a thorough, argumented and diversified afterthought. Also, in order to open up to the international public, the journal accepts to publish articles in English and/ or researches that took place in institutions from other countries, even non-francophone. The first aim of the journal is to develop and publish research as well as the professionals’ thoughts on various and diversified clinical themes through the perception of psychotherapeutical practice in care institutions. Through the editorial board but also because of its object of interest, our journal is multi-disciplinary and tries to feed the dialogue between practitioners of various horizons. Particularly interested by the theoretical and clinical heritage which nourishes these professions since decades, the Cliniques journal, created by clinical psychologists, is quite inclined to take into consideration the recent progress of the field as well as the innovations in care disposals and their evaluation. The scientific committee and the international reading board are mainly composed of professional clinicians and members of prestigious universities throughout the world. This brings a scientific guarantee through a double-blind validation. Well-established within the institutional reality of multi-disciplinary care, it offers a source of reference for professional care-givers, researchers and students. Initially, Cliniques is the artwork of a clinical study group established since 2004 by the Psychologists of the ORPEA CLINEA group, a group of private care institutions specialized in the care of physical and psychological dependency. First published as an internal journal through the name Paroles, it always offered a dialogue between the various fields of institutional caregiving. After five years of internal publication, Paroles became Cliniques and enabled authors working in institutions to discuss their practice according to a psychological theme. The journal has now grown to be a place of debate and exchanges between professionals working in private, public and associative institutions. Cliniques now is part of the Association de Promotion des Soins Psychiques en Institutions (A.P.S.P.I., Association for the Promotion of Mental Health Care in Institutions), in order to give greater echo to the scientific work it sustains. In the same way, it organizes an annual scientific symposium and publishes acts. Everyday Life in institutions : alienation or freedom? Repetition : from Resistance to Change ? Mediations : a therapeutic device ? The act : short circuit or revival ? Acting Out : Discharge or Object Intent? The Association for the Promotion of Mental Health Care in Institutions (A.P.S.P.I) aims to nourish the professionals’ thoughts on mental care in institutions in the psychiatry, child and adolescent psychiatric, geriatric, somatic and functional rehabilitation fields. The association works in favour of a dialogue between practitioners of various backgrounds. If the diversity of the approaches is privileged in the work it leads, they all are limited in the ethical and humanistic requirements of the institutional reality of plural work.